The Americans reshaped their thinking after the 2014 loss at Gleneagles, where Phil Mickelson publicly questioned Tom Watson’s leadership and the lack of player involvement. That spawned a Ryder Cup Task Force that allowed for more input from the players, and now a Ryder Cup committee comprising three players (Mickelson, Love and Tiger Woods) and the top three PGA of America officials. The committee met Dec. 6 and decided on Furyk, waiting until the start of the new year to announce him. PGA of America President Paul Levy said it took Furyk “one second” to accept the job. Furyk is 46 and still going strong on the PGA Tour. He is No. 37 in the world ranking and had a chance to make his 10th straight team last year except that he missed the first four months of the year recovering from wrist surgery. He set a PGA Tour record in August with a 58 in the final round of the Travelers Championship. Furyk had shot 59 at the BMW Championship three years earlier. The Ryder Cup has not had a playing captain since Arnold Palmer in 1963 at East Lake, and Furyk wasn’t ready to consider the prospects of playing in France even if he were to qualify for the team. “You can learn from your mistakes, and if you look at my record, I’ve learned a lot,” Furyk said with a smile. 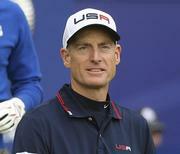 “It’s no secret it’s been my favorite event for my entire career,” Furyk said.